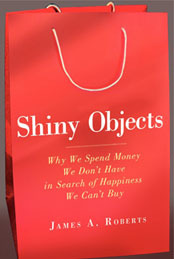 Please consider Shiny Objects as a gift for somone you love this Christmas season. The feedback I have received tells me that a lot of people are buying Shiny Objects as presents for their children and granchildren. Please spread the word. Again, thanks for your support. This entry was posted in Uncategorized and tagged CBS Early Show, happiness, Materialism, New York, Shiny Objects. Bookmark the permalink.